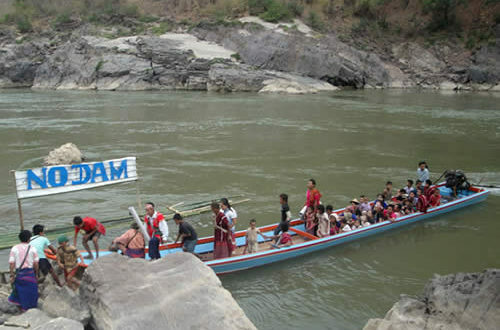 HART is publishing this open letter from the Shan community to fully express our support for their struggle against the hydro power dam on the Salween river. Read here the latest blog post relating this topic about the 21 Century Panglong Conference. We are writing to express our great concern at your government’s announcement on August 12 that you will proceed with hydropower dams on the Salween river, as the best option to meet Burma’s energy needs. The Salween is a vital artery for millions of ethnic people in eastern Burma, Thailand and China, who will be irreparably impacted by blockage of its mighty flow. There has been consistent opposition to the Salween dams by communities in Shan, Karenni, Karen and Mon States, as well as other parts of Burma and neighbouring countries. We wish to remind you that the Salween river basin has been a conflict area for decades, where the Burma Army has been relentlessly expanding and committing systematic atrocities against villagers in its attempts to control ethnic lands and resources. Pushing ahead with these unpopular dams will inevitably lead to more Burma Army militarization, increased conflict, and ongoing atrocities. The unilateral decision to go ahead with the Salween dams before political dialogue about federalism has even begun, is depriving ethnic communities of their right to decide about natural resources in their areas, and indicates a lack of sincerity towards the peace process. Coming only weeks before the planned “21st Century Panglong Conference,” this green light to the Salween dams is highly worrying. We also wish to point out that most of the energy produced by the Salween dams will be exported to neighbouring countries. It is thus false to claim that the dams must be built to address Burma’s power needs. For example, about 90% of the power produced by the 1,400 megawatt Kunlong dam and 1,200 megawatt Naung Pha dam on the Salween in northern Shan State will go to China, while ethnic peoples in Burma will bear the terrible costs. In the interests of ethnic reconciliation and environmental sustainability, we therefore strongly urge you to immediately cancel the Salween dams. Only federal policies granting equal rights to the ethnic peoples will end the civil war in Burma, a goal which our neighbouring countries will also wholeheartedly support.